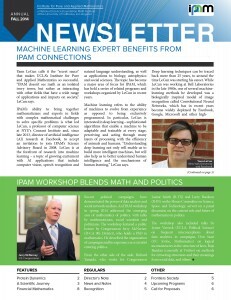 Click on the image to open our Fall 2014 annual newsletter. Contents include the cover article “Machine Learning Expert Benefits from IPAM Connections” that describes IPAM’s recent programs with Yann LeCun, professor of computer science at NYU’s Courant Institute and director of artificial intelligence for Facebook; a second main article called “Mathematics Helps Chemist Understand Protein Dynamics” that features Cecilia Clementi, a professor of chemistry at the University of Texas; a letter written by former participant and recent PhD Nina Lane (now at Intel) about her experiences at IPAM; and several short articles, a list of upcoming programs, a call for program proposals, and announcements. Enjoy!